North: Starting at the intersection of Somonauk Road and Barber Greene Road: east on Barber Greene Road to the DeKalb/Kane county line; south on the DeKalb/Kane county line to Winters Road; east on Winters Road to Fabris Road; south on the extension of Fabris Road to Beith Road; east on Beith Road to Meredith Road. East: Starting at the intersection of Beith Road and Meredith Road: south on Meredith Road to Keslinger Road; east on Keslinger Road to Dauberman Road; south on Dauberman Road to Harter Road; north west on Harter Road to Perry Road; west on Perry Road to the DeKalb/Kane county line; south on the DeKalb/Kane county line to US 30. 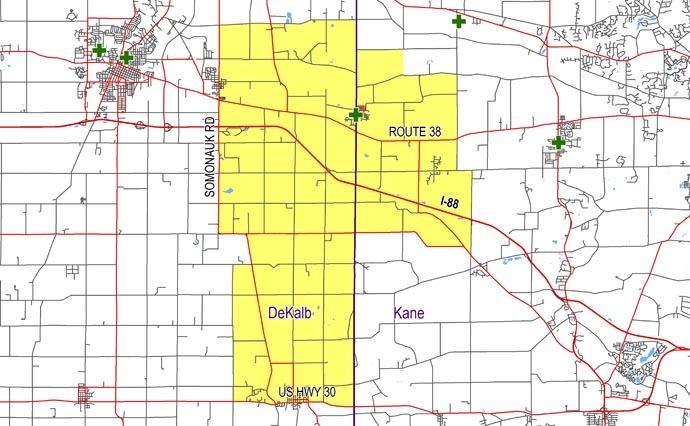 South: Starting at the intersection of the DeKalb/Kane county line and US 30: west on US 30 to Rimsnider Road. West: Starting at the intersection of US 30 and Rimsnider Road: north on Rimsnider Road to Owens Road; east on Owens Road to Somonauk Road; north on Somonauk Road to Barber Greene Road.